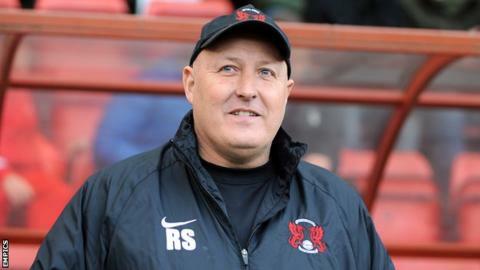 Leyton Orient manager Russell Slade says their lofty position in the League One table has left them frustrated with their 2-2 draw at Bristol City. The O's slipped to second in the table despite picking up a point on Tuesday. "We have been to Bristol City, dominated large parts of the game and drawn," Slade told BBC London 94.9. "I think it is a disappointed changing room as we were twice in front. Our own expectations have risen. We feel we should be winning a game like that." He added: "We have taken four points from two away games [after winning at Swindon on Saturday] - we should be delighted really. "Sometimes we have to be satisfied. "We know we have been knocked off the top but we have another chance on Saturday to go back top." Orient twice surrendered the lead at Ashton Gate and Slade was impressed by the spirit shown by the Robins, who are languishing in the relegation zone. "We are exciting to watch as we keep going forward," he said. "We want to create chances and sometimes you have to accept you are going to get undone, like we did on the counter-attack against Bristol City. "Fair play to Bristol City. They went a goal down, their confidence has not been fantastic over the last few weeks and they kept coming back at us. "They kept trying and you have to give them credit for that." The east London side were knocked off the top of the table by Wolves, who beat Tranmere 2-0 at Molineux. Orient have made their best-ever start to a league season after winning their opening eight games of the campaign. The O's have continued their momentum and are currently eight points clear of second-placed Peterborough and have a 14-point gap to Rotherham in seventh. Slade says he and the squad are relishing challenging for automatic promotion. "I'm absolutely loving it and I think the players are," Slade said. "We want them to play with a freedom, solve problems on the pitch and find a way of winning a game and staying in control at the same time. "We give them credit and trust them."